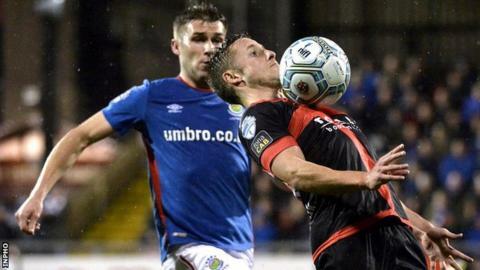 Crusaders have been drawn at home to Belfast rivals Linfield in the pick of the quarter-finals of the League Cup. Holders Ballymena United will entertain Ards at the Showgrounds while last year's beaten finalists Carrick Rangers host Cliftonville. The fourth tie pits Dungannon Swifts against Championship outfit Ballyclare Comrades at Stangmore Park. All the ties are scheduled to be played on Wednesday 15 November, with extra-time and penalties if required.